Without a doubt, my favorite part of Halloween is the costumes! 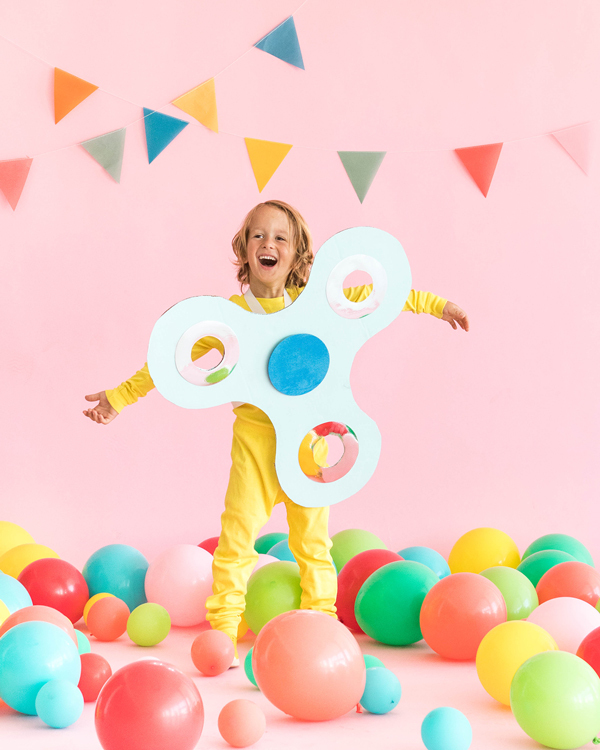 We always love taking inspiration from funny items and objects, so naturally we had to make a fidget spinner costume! 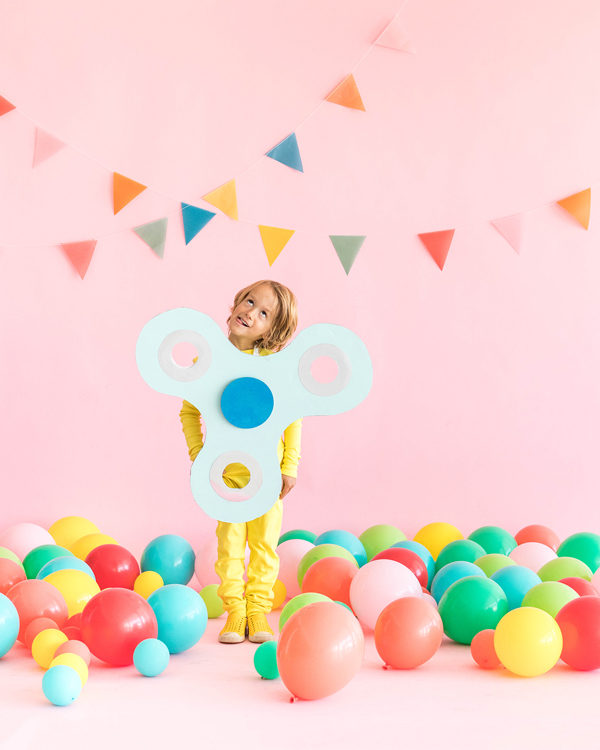 Every kid I know is obsessed with fidget spinners, and the best part about this home-made costume is that it actually spins! Try it out for yourself! 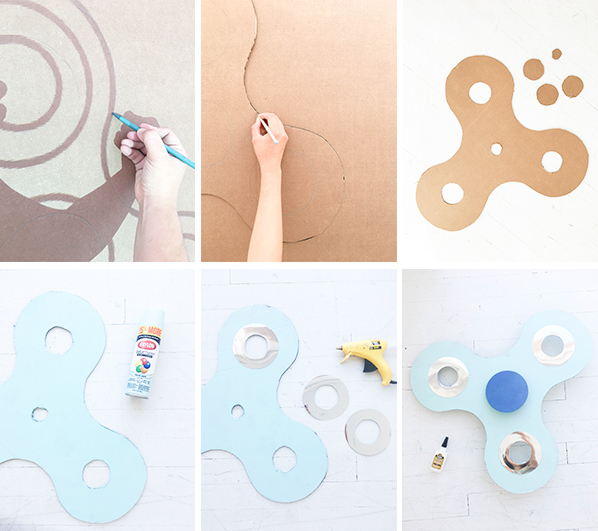 Project an image of a fidget spinner onto the wall and trace it onto a large piece of cardboard. Then cut out the outline using an x-acto. Using the wooden discs, trace 4 circles on the cardboard fidget spinner: one at the center and three that are equidistant from the center. Once your circles are traced, cut out a 1 ½” inch circle from the center circle and 3” inch circles from the outer circles. Spray paint your cardboard cutout on both sides. Trace the wooden disc onto the mirrorboard. Cut out a total of six circles. Cut out a 3” inch circle from the center of each mirrorboard circle. Glue the mirrorboard ring pieces onto the fidget spinner around each outer hole. Spray paint two wooden discs a different color than your cardboard cutout. 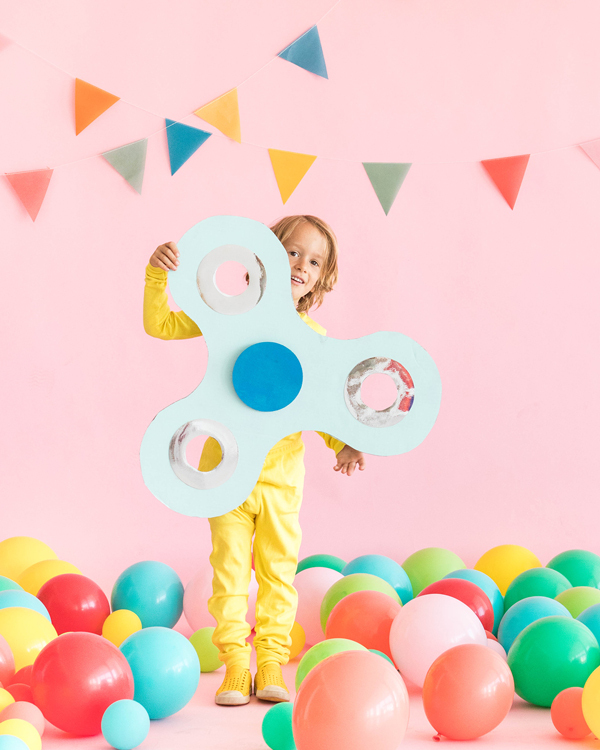 Attach the disc onto the spool with wood glue and slide the spool through the center of the fidget spinner. Glue another wooden disc onto the other end of the spool. Depending on how close your want the costume to your body, wrap rubber bands between the wooden disc and your body. Create a harness from nylon webbing, using the wearer for reference. Attach your harness onto the back of the wooden disc with hot glue. 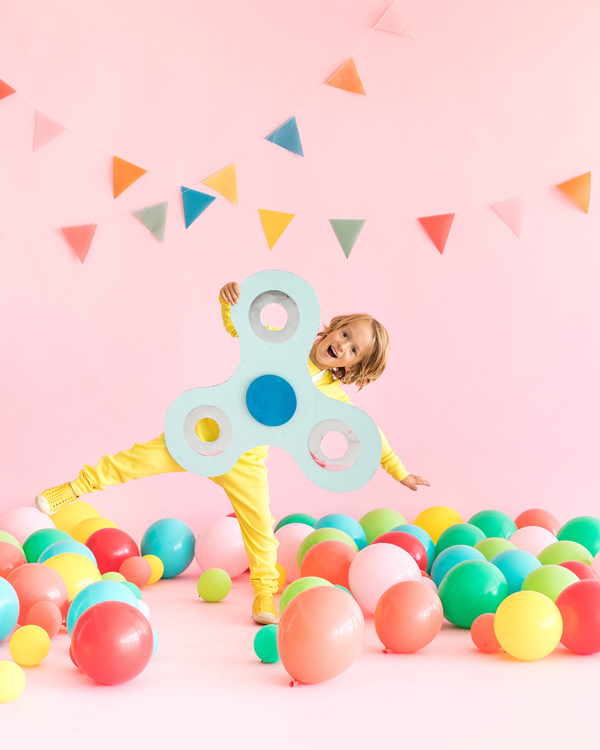 Time to take your fidget spinner costume for a spin! Thanks to little E for modeling! This costume is incredible! Showed my 7-year-old and he was in! So, now that we’re going to make this thing, I’d like to know the approximate dimensions of the one you created in the photos above. Could you share? Thanks for such a fantastic costume idea. Hi Renee! The full diameter is about 24 inches across. Happy Crafting!! I love kids. My daughter loves Spray paint on cardboard, trying to draw innovative art. What a great ,easy idea! Your model is darling! They are a perfect match! 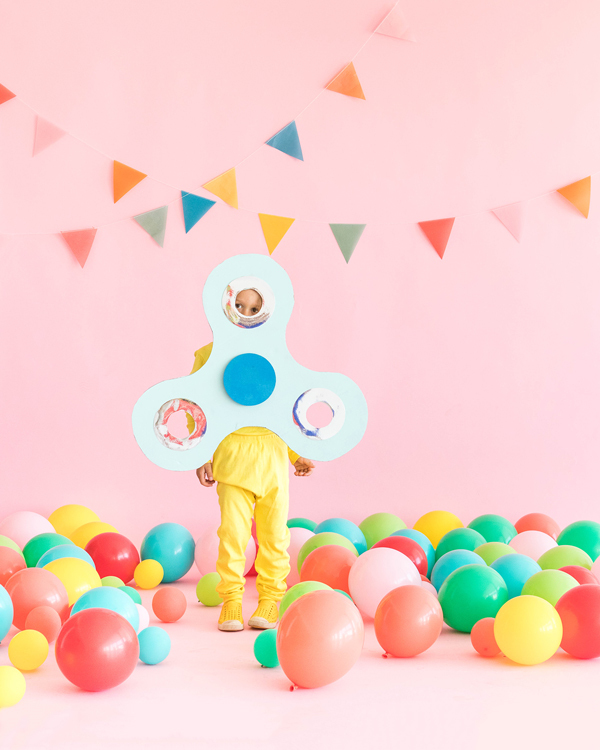 Off to Google fidget spinners…! What a cute idea!! I love how you set up your photoshoot too, so unique! I am sure my kids would live this home made costume. Fun part is that it actually spins . Thanks for the inspiration! Showed my 12 year old (since he had no idea what he wanted to do for Halloween) and this is the costume he wants this year! Great idea!